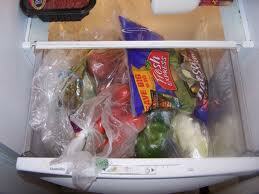 I would venture to bet that we all have some vegetables in our crisper drawer that have seen better days. Rather than just tossing out all those well-intended vegetables, I like to throw them in a large pot of water with salt, pepper, garlic, and other herbs and seasonings to make a vegetable broth. I bring everything to a boil, cover, and simmer on low for an hour or so. After it cools completely, I store my broth in 4 cup increments in large ziploc bags. I lay the bags flat and freeze them that way so they take up minimal space. If you need the broth in a hurry, just cut the bag straight down the middle and place the block of frozen broth in a pot to heat on the stove or a glass bowl to nuke in the microwave. So rather than tossing all your leftover Thanksgiving vegetables in the trash, put them to good use and make broth for all your winter soups like my Black and Orange Chili or Stonyfiled’s Vegetable and Chicken Curry.